Island fishermen living on the islands off the coast of Maine area a creative group. Early on the Tuesday after Memorial Day, six of us packed up and headed out from Stonington on the Sunbeam, the Seacoast Mission’s boat. This was the Sunbeam’s last trip to the islands before being hauled out at Billings Marine for maintenance and painting. As the guest on board, I was along to talk with fishermen and their families including kids, and give fishing safety talks at Frenchboro, Matinicus, and Isle au Haut, the three ports-of-call for the Sunbeam. I thoroughly enjoyed this assignment: the crew was terrific and hard working – captain, engineer, nurse, counselor, and cook – and the island fisher families were all personable and welcoming. I learned a lot from the stories, challenges, and innovations they bring to the table. So, in addition to great food, what’s on the menu? We arrived at Frenchboro in the late morning and headed off to the post office and the school house. At 4 pm the fishermen, a few wives and kids arrived for the safety talk. At each island we wanted to emphasize the importance of periodically inspecting and trying on survival suits to be sure they have no tears/weak spots and still fit. We have indeed had a casualty in the Northeast in which a fisherman failed to survive because he couldn’t zip up his suit. One of the fishermen volunteered to be timed to demonstrate that proper donning of the survival suit can be done within a minute’s time. Survival suit zippers must be kept waxed so they don’t rust. I handed out synthetic zipper lubricant, courtesy of the USCG dockside exam program, and pointed out that the only substances that are safe for the neoprene suits are bee’s wax or synthetic zipper wax. We talked about buoys and the hazards of paints and UV protectants with high amounts of toxic volatile organic compounds (VOCs) such as benzene and toluene. One lobsterman offered that fishermen are now actually purchasing pre-painted bouys. Instead of painting on their identification colors, they are using colored tape, apparently very successfully. In place of heat branding buoys, they are using markers. As one young lobsterman said, “No paints – we avoid all those exposures.” Applause! Sharon, the RN on this telemedicine boat, advocates that every lobster boat have a rope ladder for re-entry in the event of a man overboard situation. Meanwhile, among those making ladders was a wife who was intrigued that she might be able to make ladders for sale. On Matinicus, the next day, a lobsterman took Sharon and me to his workshop. He showed us an innovative arrangement for increasing ventilation at the workbench where he sands, paints, and burns rope. He had mounted two room-size, table top fans, minus their stands, in a plywood panel and attached the panel to the wall with a piano hinge. When he works at the bench, he swings the window open, flips the panel down into the window space and turns on the fans. This seems to be an effective strategy for avoiding exposures to sanding particulates, branding fumes, rope smoke, and paint volatiles. Finally on Isle au Haut, the third and final day, a breakfast session (with a delicious egg strada) drew adults and two middle-school boys. The boys were quick to catch on to the whipstitch used to make the rungs of the rope ladder. One, in particular, built his ladder in record time, tied it to the Sunbeam’s stern railing and threw it over the stern. As we were at the wharf, he was able to walk onto the narrow platform at the stern, grab the ladder and climb up and into the boat. Pleased with his construction, he tried it again. Regarding knife handles: Most of the knives sold in bulk at marine stores have a handle that is too small to allow a grip that will provide the maximum force to, say, cut yourself free if entangled in trap rope. The rule of thumb for maximum grip force is a handle that allows your thumb to overlap your third finger only as far as the first knuckle. The fishermen I talked with on this trip were quick to mention the larger-handled knives they have purchased to wear on their oilskin suspenders. Independent thought, creativity, and a willingness to experiment are characteristics common to islanders. Their solitary life requires them to reach a little further for solutions. It is encouraging to learn that they are applying this same approach to fishing safety issues. 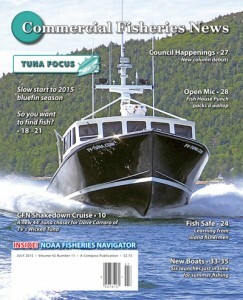 Read the rest of the July issue of Commercial Fisheries News.